because the promise 4 paws family has grown so much over the past few years, we have two groups of dogs. 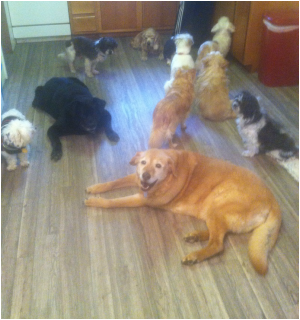 The first group, of course, is our dogs that live at the sanctuary. These are the dogs that are guaranteed to greet you with a smile when you come visit. Our other group of pups are what we call our forever foster dogs. These are dogs that we currently care for and are financially responsible for; however, they are living in individual foster homes. Every once and awhile you’ll see a few of these guys at the sanctuary when their fosters come visit.